Line plots are often best to illustrate the change in a variable over time. Unlike bar plots, I think the variable in line plots should not be a sum or count metric. For example, I would use a line plot for visualizing temperature data over time because temperature is just a single recorded value. I want to see the general trend of the change in temperature for the months in San Francisco, California. 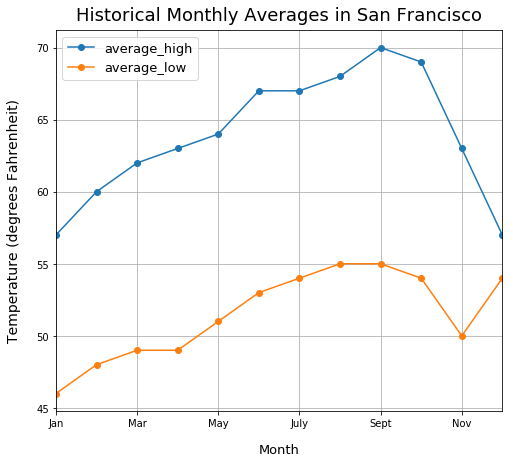 The coolest months in San Francisco tend to be December to February while the warmest ones tend to be June to October. As a child, when I did yearly checkups at my doctor's office, my doctor recorded my height. 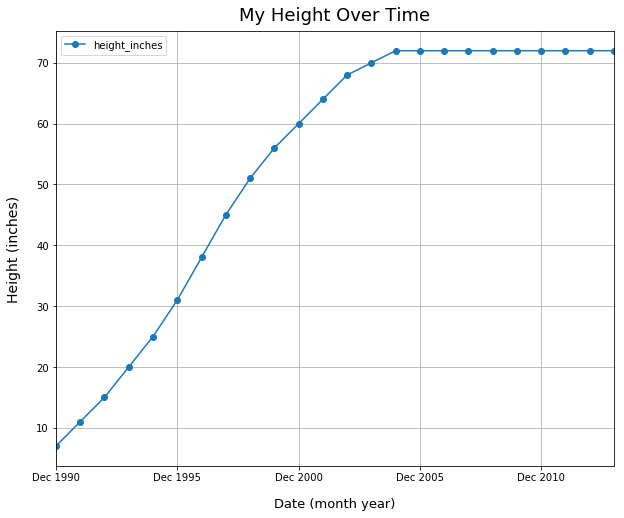 Below, I plotted fictional data of my height over time. I grew very rapidly until about December 2002, then only grew a couple inches over the next two years, and by 2004, I stopped growing in height.